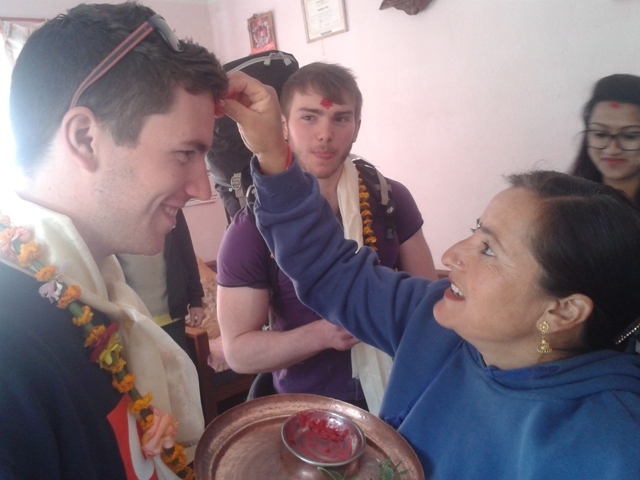 Thank you to Kenny for his fantastic account of what life with a Nepali family is like! “Living in Godavari has been one of the highlights of my life. Each morning on my walk to school, I stop and stare at the village and all of its beauty. Walking down dirt paths protected by high trees, I meet several locals all happy to exchange a ‘namaste.’ By the time I reach school, the morning mist has settled and from the courtyard I can see the fierce Langtang Himalaya Range piercing the blue sky. My time in Godavari has been made incredibly enjoyable thanks to the hospitality and kindness of my host family. Having had nearly 30 foreigners stay with them over the past seven years, they knew exactly how to make me feel at home. As the first Canadian guest, I am sure that they will remember me almost as much as I will remember them. Every morning, I wake up at around 6:00am to the sound of roosters breaking the peaceful silence of the night. Around 6:30, prayer bells ring from every house in the village ensuring that no one sleeps in. Though I try my best to fall back asleep, I am too caught up with the excitement of being in Nepal to let myself. At 7:30 my alarm rings like a cue for my Ama (mother) to open my door with a cup of hot tea and biscuits. At 8:30am, she cooks me rice, lentils and curry (dal bhat) often followed by pea soup with all ingredients coming from the diverse organic garden that surrounds their house. She loads up my plate, as all Nepali mothers do, and pushes more food on me until I say ‘pughiyo’ meaning ‘I am full’. After refusing more food I assure her that the meal was ‘mitto’ meaning delicious and say ‘dhanya-bahd’ (thank you) before packing my bags for school. When I come home from teaching around 3:00pm, I am often the only one home. Usually, I will read or write in the front yard of my home and around 3:30 my Ama will show up carrying a massive bundle of wood on her back held together with strap firmly tied around her forehead. I try to tell her that I can help her carry it but she refuses and the most work she has let me do is water the onion patch once. Shortly after she piles the firewood against the wall, she wipes the sweat from her brow and heads to the kitchen to make me a cup of tea and a snack. After she has provided me with tea and a full belly, she will sit in the sun and socialize with the other women of the village. As she does so, my Baba (father) and his seven-year-old nephew Niton come home from school and become my source of entertainment for the evening. Niton is a hilarious young boy who reminds me that kids are the same everywhere I go. When the power is available, he sprints into the Silwal’s house to watch cartoons and when it is not, he comes to me to play. His favourite game is ‘Statue’ or ‘stat-too’ as he likes to say. This game requires Niton to yell ‘stat-too’ at me and I have to freeze until he says ‘okay, you move’ and then I am free from his spell. When the game becomes too much for me to handle, I yell ‘stat-too’ at him and take a long deserved break before letting him move next. My Baba is a local school teacher who enjoys a few drinks after work usually leading to hilarious stories that I often don’t fully understand but they still leave me in stiches. I can tell that he misses his son who is a peace-keeper in the Democratic Republic of Congo and is trying to fill the void by spending time with me. I am happy to be his temporary son and we have grown to become quite close over the past three weeks. Thanks, Kenny, for this excellent description of life living with a family in Nepal. We are looking forward to sending our next group of volunteers to Nepal in the New Year so, if you would like to experience the hospitality of the Silwal’s or one of the many families we work with, check out our teaching in Nepal webpage and apply today!